Bangladesh's former premier and key-opposition party outside parliament BNP chief Khaleda Zia was today granted bail after she surrendered before a court here over a nearly USD 2 billion graft case dating back to 2007 when she exhausted all legal options to evade the trial. "The judge (Mohammad Aminul Islam) granted her bail as she surrendered but asked her to appear on December 28, setting the date for indictment hearing," prosecutor Mosharraf Hossain Kajol told PTI. He said 70-year-old Zia was forced to surrender in line with a Supreme Court decision which had rejected her plea to quash the corruption case over contracting out a major gas field to Canada's Niko Resources allegedly in exchange of kickbacks during her 2001-2006 tenure, causing a loss of Taka 137 billion (USD 1.78 billion) to the state exchequer. 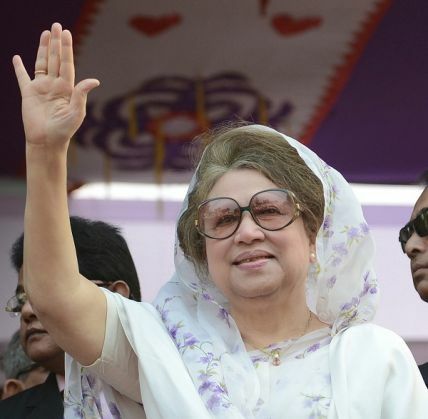 Witnesses said several contingents of elite anti-crime Rapid Action Battalion joined the armed police to enforce an extra security measure around the court complex in Old Dhaka as Zia appeared on the dock escorted by a large number of pro-BNP lawyers who stood in her defence. The High Court on July 9, 2008 stayed proceedings of the case and issued a ruling after Zia filed the petition while it was subsequently upheld by the apex court as the statutory Anti-Corruption Commission (ACC) challenged the High Court order. The proceedings were stalled since the ACC took initiative to revive it earlier this year and eventually the High Court rejected her plea to scrap the case and order the ex-premier to surrender before the trial court in two months. Several former ministers of Zia's BNP-led four-party coalition government and officials, including former law minister Moudud Ahmed and former state minister for energy AKM Mosharraf Hossain, are co-accused in the case being tried at the Special Judge s Court. Zia is also being tried in two other graft cases involving two charities named after her husband slain president and BNP s founder and ex-president Ziaur Rahman. The two-times former prime minister has said that all of the cases against her are politically motivated. Zia was prime minister from 1991-1996 and 2001-2006.